The Lady Hornets did it again. They won the regional championship for the sixth season in a row. The team was first out of five teams. Beatty won with 179 points, Tonopah was second (131), Round Mountain third (40), Pahranagat Valley was fourth (36) and Indian Springs fifth (20). Jasmine Pelayo was the regional champion in the 1,600 (6:36.37) and the 3,200 (15:09.21). Abby Panlaqui took first in the 300 hurdles (1:10.87). The Beatty girls were also champions in the 4×200, which was composed of Maggie Cathcart, Andrea Leon, Vanessa Gamboa and Alexia Gil (2:02.19). In the field events, Alexia Gil was the shot put champion, (29-10) and Arianna Oseguera was the discus champ (78-06). 100 meter: Vanessa Gamboa second place (14.39), Maggie Cathcart and Sandra Garcia fourth (16.64); 200 meter: Gamboa second (30.12) and Abby Panlaqui fourth (36.33); 400 meter: Andrea Leon second place (1:12). 100 hurdles: Panlaqui second place (23.51). 4×100 relay second (58.70) composed of Cathcart, Gil, Sandra Garcia and Gamboa. 4×400 (5:19.72): Claudia Granados, Garcia, Pelayo and Leon, second place. 4×800 (13:36.03) Granados, Aysleen Guerra, Pelayo and Leon second place. Oseguera took second in the shot put (26-08.25); Rachael Anderson took fourth in the discus; in the long jump, Cathcart took second (12-06.50) and Granados took fourth (11-02). The Beatty boys had a big surprise on Saturday as Robby Revert took home the gold. He was the only individual regional champion for the boys in the shot put (37-02.5). The boys took second at the regional meet (99.5) out of 7 teams. Spring Mountain was first (309), Tonopah third (63), Indian Springs fourth (42), Round Mountain was fifth (34). Revert in April said he wasn’t thinking championship. 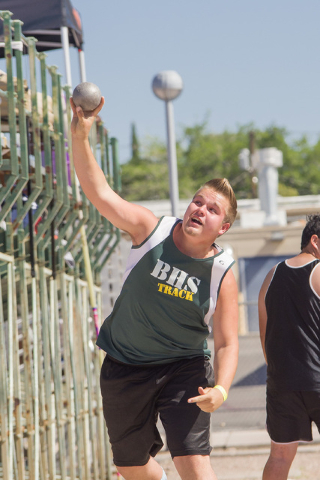 At the time he was just happy to beat Jordan Berkowitz of Tonopah, who was throwing around 34-36 feet at the time. He said he got some last-minute training though from former head track coach Jerry Adcox and Steve Sullivan. He said his first throw at the regional was not that amazing. Revert said he wants at least a 38 for state and next year wants to be throwing in the 40s. The other champions came in one of the relay teams. Beatty took first in the 4×200-meter relay (1:39.06) composed of Jacob Oseguera, Nate Russell, Michael Olson and Jhonpaul Adajar. Shot put: Revert 37-2, Jhonpaul Adajar 35-06.25 fourth place; discus: Revert 101-0 third place; triple jump: Michael Olson 38-02, second place, Francisco Cardenas 36-08, fourth place; high jump Julias Max Taylor 5-02, fourth place; Brandon Rebujio: 1,600 (5:36.4) third place, 3,200 (12:45.93) third place. Relay teams: 4×400: Daniel Catillo, Max Taylor, Nahum Favela and Cardenas (4:01.36) third place; 4×100: Favela, Jacob Oseguera, Michael Olson and Adajar (47.28) third place.